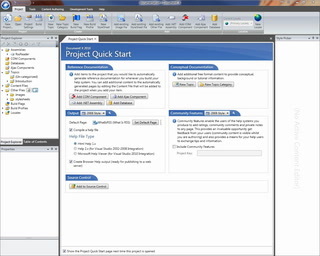 Define Project Properties and related values in the Project Settings or Build Profile editors. For cross-platform help systems, or where a browser based help system is required, HelpStudio delivers the same level of functionality you would find in a compiled help system. The look and feel of the browser help output is easily customized. A Full Text Search capability. Help content is displayed in a separate pane so that the navigation area always remains accessible. Microsoft HTML Help is the windows standard help format. HTML Help files contain all of your help system content compressed to minimize use of disk space. 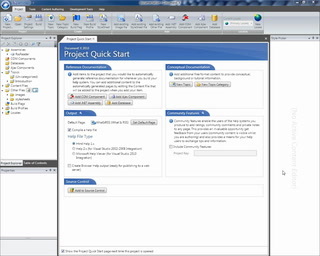 The Microsoft HTML Help viewer provides a Table of Contents, Index and Full Text Search capability and is ideally suited for Windows application help files. 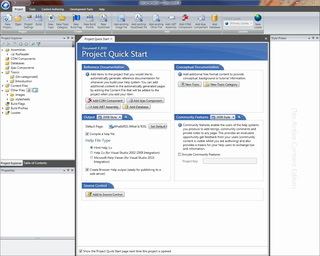 HelpStudio creates PDF Booklets natively. Adobe software or a PDF printer driver are not required. HelpStudio can automatically convert hyperlinks to make them suitable for a printed medium - allowing you to leverage your existing on-line content and reduce maintenance effort. Build flags can be used to mark content as specific to either on-line or booklet output. Topics can be created specifically for booklet output, or existing content re-used. Microsoft Help 2.x is the help format used by Visual Studio 2002-2008. Help 2.x is the format to choose if you are creating help for a Visual Studio 2002-2008 Add-In or a .NET component. Help 2.x does not include a redistributable viewer, so isn't a suitable format for Windows application help. Help 2.x files are more complex that Html Help files to deploy manually, requiring a complex Windows Installer configuration to ensure that they are correctly registered. HelpStudio solves this problem by including a distributable Help 2.x registration tool to simplify registration and plugging in to the Visual Studio help system. If you are creating help for a .NET component, you can use Document! X to seamlessly include full reference documentation. Microsoft Help Viewer is the help format used by Visual Studio 2010 - 2017 . Microsoft Help Viewer is the format to choose if you are creating help for a Visual Studio 2010 - 2017 Add-In or a .NET component. Microsoft Help Viewer does not include a redistributable viewer, so isn't a suitable format for Windows application help.